Are you an adventurous eater? I know lots of people shy away from raw fish but I gotta tell you this Ahi Poké is FANTASTIC! If you love seafood, sushi, sashimi and the like, you’ll love this too! 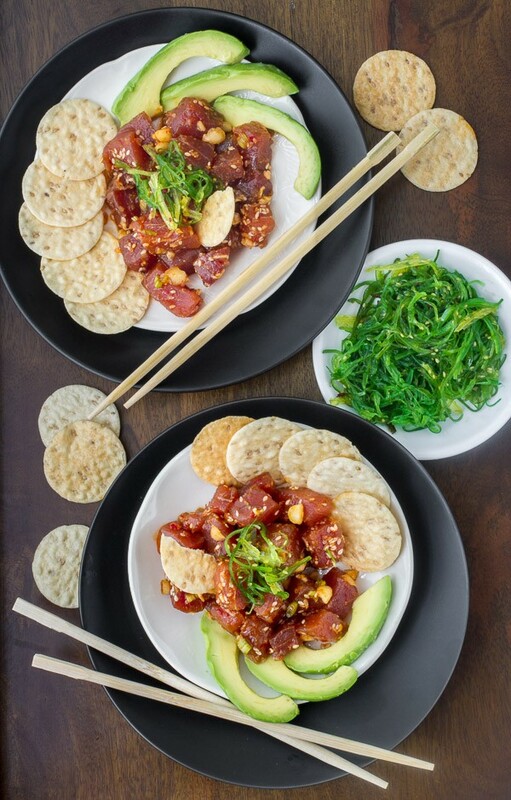 I’ve loved poké (correctly pronounced poke-ay, many say poke-ee) since the first time I had it in Hawaii many, many years ago. For some strange reason, ever since I moved to Florida I’ve consumed a LOT of Ahi Poké. Maybe it’s the hot weather and living in shorts and sleeveless shirts year round, I seem to be making better choices when I go out to eat. Luckily, poké is so common on restaurant menus that I just can’t resist when I see it. But why wait to go out to eat to enjoy some ahi poké? 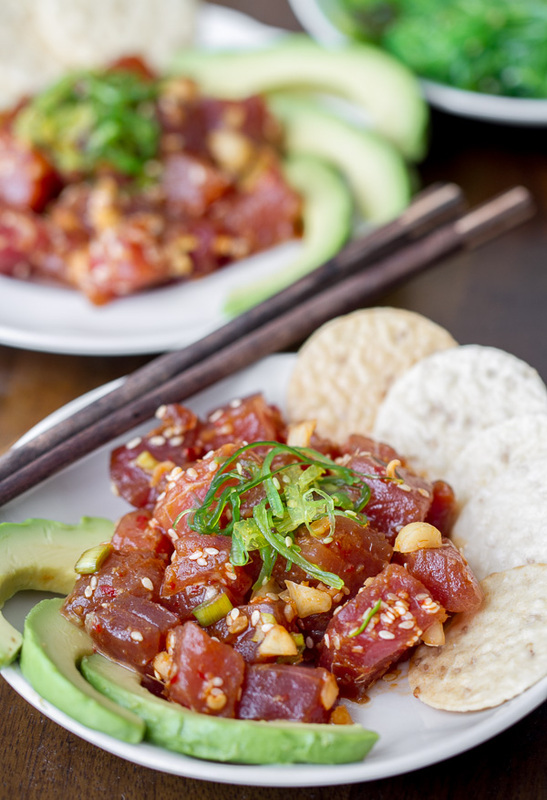 It’s really simple to make, all you need is some fresh sashimi grade tuna. I found a fantastic fish market near my house and all the seafood is so fresh and delicious. There’s lots of variations for ahi poké, but they all seem to have a little soy sauce (I used Shoyu soy sauce), green onions, sesame, perhaps some ginger, etc. I chopped up some macadamia nuts I had in the pantry and toasted them with some sesame seeds. Added a wonderful little crunch which I liked. I ate it with sesame rice crackers, some seaweed salad and avocados. Such a delicious lunch! In skillet over medium high heat, toast macadamia nuts and sesame seeds. Be careful not to let it burn. When golden, remove from heat, add a little salt and give it a stir. Set aside to cool. In bowl, add shoyu, sesame oil, ginger, chili, rice vinegar and green onion. Whisk to combine. Add ahi and macadamia/sesame mixture, stir to evenly coat the ahi. Set aside and chill for an hour prior to serving. If you make some Ahi Poké, take a pic and tag me @imboredletsgo on Instagram so I can like and comment on your photos! You can also catch up with me on Facebook, Pinterest, Instagram or Twitter. I’d love for you to follow along! Thanks for the inspiration to make my own! This looks absolutely amazing! Sushi is my all time favorite food, so I know for a fact I would LOVE this!! Can’t wait to try :). I love sushi too…have to admit I was a little hesitant to make it at home but it was awesome! Thanks Levan…I think you’re my kind of friend! This looks AMAZING. I am not at all worried about eating raw fish in a restaurant, but I am always worried about knowing I got the right quality of tuna to eat it raw at home. Especially living in the middle lol, not near any coasts. No fantastic fish markets near me. So for now I will stare and salivate! This looks delicious! I LOVE ahi tuna! My husband doesn’t eat a lot of fish, so I don’t have many opportunities to try recipes like this! I might have to do it just for myself! This is beautiful. I am way too afraid to do anything with raw fish at home. Your pictures are stunning.